I discovered the concept of Mass Customization long ago as a strategic planner at IBM by reading Stan Davis’ amazing and prescient book Future Perfect. 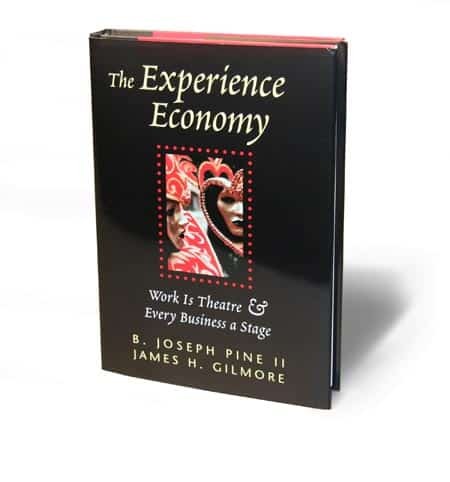 When IBM sent me to MIT for a year to get my master’s degree, I determined to turn my thesis into a full book treatment of the subject, resulting in Mass Customization: The New Frontier in Business Competition. A modular architecture – differing modules of functionality plus a linkage system for connecting them together – enables a company to create different offerings for different customers by dynamically selecting the particular set of modules that match a customer’s wants, needs, or desires, and then linking them together to create a customer-unique offering. In this manner, the company can stop producing the economic waste of doing the same thing for everybody, and instead eliminate that waste by doing only and exactly what each individual customer wants. Cutting a particular element to a specific length, such as laser-cutting a pair of jeans to match a customers’ inseam. Connecting multiple, different components to one standard and extensible linkage system, such as linking together differing electronic components (CPU, memory, drives, etc.) through the backplane (or “bus”) of a personal computer. Connecting modules together themselves, via a standard interface, without the need for a separate linkage system, such as the simple example of a sectional sofa and the most robust example of LEGO building bricks. Mixing together independent constituents into a final blend, such as mixing various paints together to yield a particular desired color. By far the most robust form of these six types of modularity is sectional modularity, epitomized again by the vast number of LEGO elements. For what can you build with LEGOs? Anything you want! Because of all the different elements of different sizes, shapes, and colors and, just as important, the simple and elegant linkage system for snapping them together, you can put them together in virtually limitless ways. Take, for example, the relatively simple case of six 2×4 bricks (those with eight studs on top) – and we’ll even ignore color. In 1999, LEGO System A/S published in The Ultimate LEGO Book the number of combinations that could be built with just these six bricks: an astounding 102,981,500! But some Danish mathematicians, instigated by a high school student to figure out how LEGO calculated that number, realized that LEGO was wrong. First, they came up with the actual calculation of 102,981,504 (half of which are mirror images of each other), which LEGO had obviously just rounded down. But they further realized this was a considerable underestimate, in fact, as LEGO only counted six-high combinations, designs where each brick was on top of another in some way. 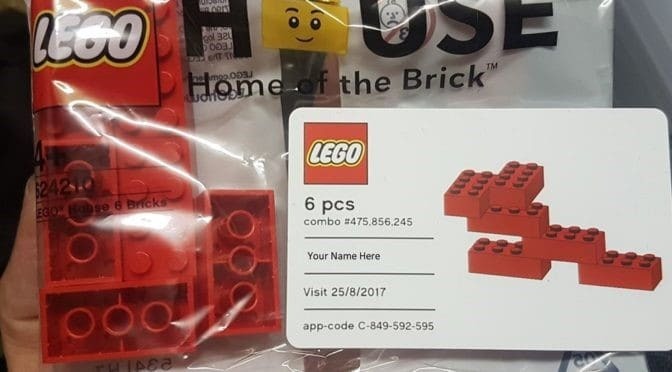 One can, however, also put bricks side by side, yielding five-high combinations as well as four-, three-, and two-high combinations. (There are no one-high combinations, as the bricks would then simply be laying on the table. Or, more likely, the floor.) So in their paper, “A LEGO Counting problem”, the Danish mathematicians showed that the actual number of combinations for six 2×4 bricks is an astronomical 915,103,765! That is the power of sectional modularity. You may have noticed that I used only manufactured goods examples above, as the concept of modularity was initially only applied in that sector of the economy. But services can be mass customized as well! Component-sharing modularity: Many services can share components among final economic offerings, such as the legal “boilerplate” language in terms and conditions that are reused over and over again. Component-swapping modularity: My longtime favorite, simple example of mass customizing services uses component-swapping modularity – salad bars. The linkage system is simply the plate that holds the components together into one salad! And note that in the entire history of the world no two people have ever had exactly the same salad from a salad bar, even when using the same components, for the amounts of each always differ at least ever-so-slightly. Cut-to-fit modularity: The tailoring of an apparel item (such as suit jacket and pants) requires cutting to fit, as does cooking meat to order. Mix modularity: Think of the prototypical Chinese or Mexican restaurant with scores of menu items made from surprisingly few ingredients. Interestingly, while working on this Thoughts post on a flight, I saw in The New York Times an ad from Chipotle that visually provided “the complete list of Chipotle ingredients”, from avocado to yellow onion, that the company mixes together to create its custom burritos (the first three of 13 rows are shown nearby). Bus modularity: Here the term actually comes from a service, transportation buses, where differing people get on and off a bus at different times. Sectional modularity: I see this in the insurance industry, with USAA providing a customized set of offerings mixed-and-matched for different “life events” (eg, getting married, starting a new job, moving) and Progressive’s way of slicing-and-dicing policy particulars to match whatever price a prospective policyholder wants to pay. And we can’t leave out experiences, which of course can also embrace modularity. Most computer games today are, for example, built with game engines such as Unity 3D or Unreal Engine, an example of component-sharing modularity. The users of many such games can further use component-swapping modularity to “skin” their avatars. Massages can vary in time (30, 45, 60 minutes, eg) to fit a guest’s schedule and needs, which is cut-to-fit modularity with time being the component that is cut in length or duration to fit each particular guest. In fact, time is THE key element when staging experiences, customized or otherwise! As I made clear in an earlier Thoughts post, “The Year of Retail Experiences”, experiences are about time well spent. Designing experiences is designing time – the time customers spend with you. So of all forms of modularity, the key one to think about for experiences is bus modularity, where time is the bus. Time is the linkage system on which different experience segments (or even service segments that build up into an overarching experience) can be placed, creating a mass customized journey through time, the dramatic arc of the experience. This is how our 2017 Experience Stager of the Year (EXPY) award winner, Carnival Corp., designs a mass customized itinerary for each guest using its Ocean Medallion program. The program is centered around an IoT device of that name, which enables Carnival to identify each individual guest (with Princess Cruises the inaugural brand to use the program). As I discuss in an earlier Thoughts post, “Mass Customizing Guest Experiences at Carnival Corp.”, based on responses to a pre-cruise query about favorite experiences and pre-embarkation bookings, the company puts together a personal itinerary for every guest, which then can be modified in real time while on board. This itinerary covers the entire time while on board, representing the “bus” of time each guest has across the cruise. Guests can access and update it while on board through the Ocean Compass app on their phone, tablet, stateroom TV, or public monitors around the ship. As Carnival learns more and more about the guest – through direct responses, how well they rate their experiences, and even such factors as the weather at the moment – it sends Personal Experience Invitations to individual guests that match their interests and the time they have available. Each potential experience on and off the ship are modules that can be linked together on the bus of time to mass customize guest experiences. 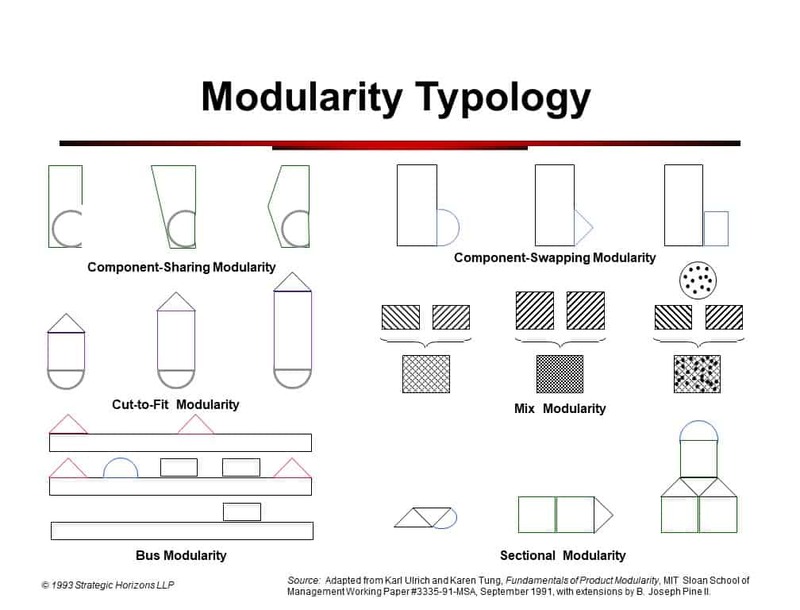 The concept that bus modularity was the type most amenable to mass customizing experiences only occurred to me a few years ago, but in just the past few months I hit on another idea that should have been clear long ago: there is a seventh type of modularity, digital modularity. Digital technology presents the ultimate in modularity, more powerful even than sectional modularity. For you can combine bits of zeroes and ones into modular bytes, and those bytes into modular strings, and those strings into modules of code and information of increasing meaning and value, precisely because of this nested architecture of modularity. Many industries today have essentially information-based offerings, including news, music, entertainment and media of all stripes, games across all digital platforms, telecommunications, banking, and insurance. And so all such industries have gained greater levels of customization following on every stride in digitization (and will continue to in the future as companies increasingly understand the full power of modularity for mass customizing). And as with all forms of modularity, even if you can’t digitize your product you may be able to digitize your processes to make them more efficient and easier to link together physical modules on behalf of individual customers. Or you can digitize information about your products, including how you present your offerings to each customer on your website or app, say, or in a design tool that enables customers to figure out exactly what they want. 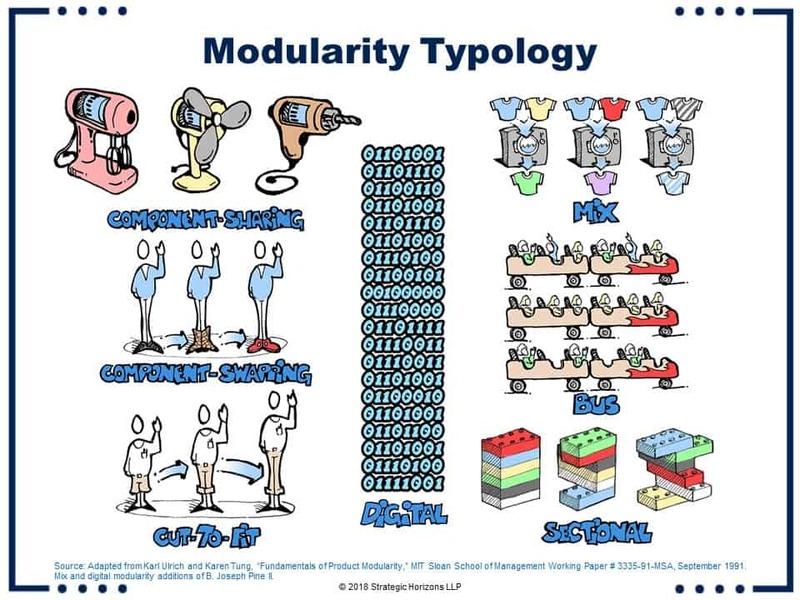 So the nearby chart – illustrated so wonderfully by my visual translator, Kevin Dulle of The thINKing Canvas – provides all seven types of modularity. Use it to determine what form(s) would be most appropriate in your situation to mass customize your offerings to each one of your individual customers. For customers today deserve to get exactly what they want at a price they’re willing to pay.